EDIS Free Tier provides free electrical test certificate software for electricians to create, edit, complete and print electrical test certificates. The EDIS Enterprise enables large estates and buildings to manage their electrical certificates, distribution boards and electrical compliance using a single cloud based respository. EDIS Enterprise powers Smarter EI&T saving time money and reducing risk. Meeting the challenge of reducing electrical compliance costs! This EDIS Best Practice provides information on the potential savings which can be achieved through better electrical compliance management. The best practice is found here. AN EDIS BEST PRACTICE: WHAT NEEDS TO BE TESTED? EDIS CLOUD PROVIDES SIMPLE, WEB-BASED ELECTRICAL TESTING SOFTWARE - A SOLUTION FOR CREATING, STORING AND RETRIEVING ELECTRICAL TEST CERTIFICATES, DISTRIBUTION BOARDS SCHEDULES AND ALL OTHER DATA ASSOCIATED WITH ELECTRICAL INFRASTRUCTURE. EDIS is used by large and small property managers, facilities managers, electrical contractors and electricians to keep track of electrical testing, electrical safety and the associated certificates and documentation. EDIS follows the BS7671, 2008 Amendment No.1 format, including the latest forms for capturing faults, test results and distribution board schedules. EDIS enables a team of electricians to easily complete work and certificates across an estate of geographically dispersed buildings. 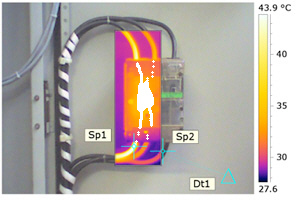 Functionality to allow the uploading of thermo graphic images associated with boards, panel and switches is an unused,but valuable feature in EDIS. This features provides a way to keep track of thermographic images which otherwise be stored on a server, CD or paper. Having the thermographic image easily accessible with a chronological view of images over time enables any deterioration to be more easily identified.